We all go through cravings/fetishes at some point in time. Some times they are shoe related, or clothing related or food related! Unlike clothing related fetishes, baking fetishes often take time and energy to perfect. You can't quite buy the item and then be content. There often is a burning desire to become competent in baking that particular item. 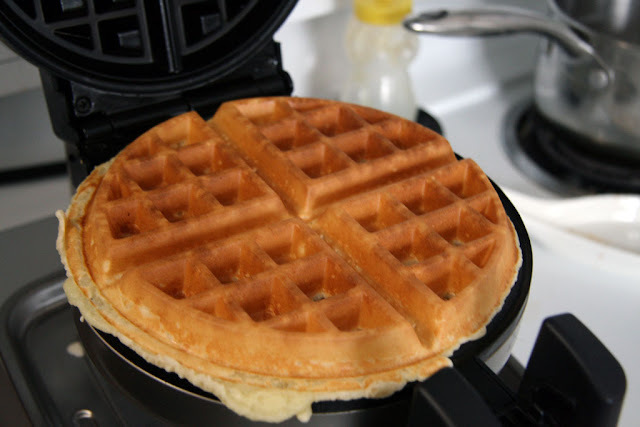 For a while I was obsessed with making waffles as my previous post highlights. 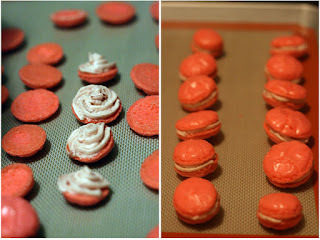 Lately, it has been the pursuit of making the elusive macaron! After reading and researching a number of macaron recipes, I knew I was ready to start. I decided the October Mac Tweets Challenge was a good incentive. So, I spent time over the Canadian Thanksgiving long weekend for my first attempts. 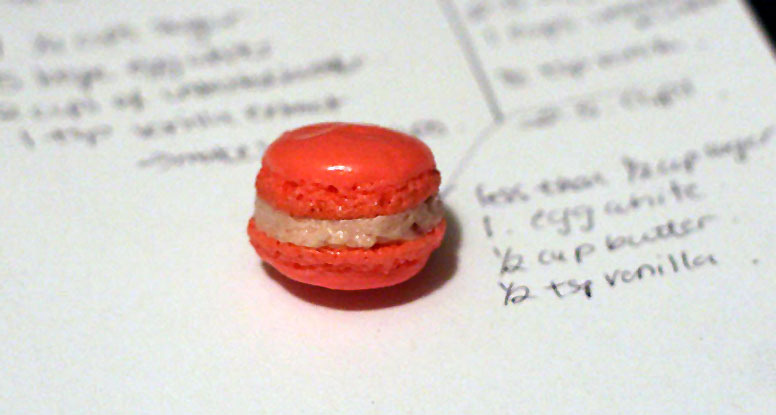 I also armed myself with some macaron making items in order to give my macarons their best possible chance (i.e. silpat mat, thicker baking sheet, albumen powder, aged egg whites). I also hoped to achieve the pied on my macarons. I'm not sure if you need a thicker baking sheet, but it definitely helps prevent the macarons from cooking too fast as they rise in the oven - which gives them the pied. The albumen powder (dehydrated egg white powder) gives more stability to the meringue structure so the shells will stand up better in the oven as heat is being pushed through it from the bottom. Measure and mix together albumen, granulated sugar and cream of tartar in a bowl and set aside. Place aged egg whites into mixing bowl (ensure it is perfectly clean) and begin beating egg whites on low speed until foamy. Once egg whites are foamy (they should look bubbly and white), slowly add in mixture from step 1 and beat on medium speed (speed 5/6 on KA). Beat until a firm meringue forms. Do a check by stopping the mixer and tilting the head back to check the firmness of the peak. If a peak stays up, then you are done. Ensure that they are not stiff or foamy since that means you have gone too far! Add in food colouring (gel colouring is best) with a toothpick. Stir until uniform in colour. Add almond mixture into meringue mixture. Stir with paddle attachment on Kitchen Aid for 10 seconds then stop. Unhinge mixing bowl and stir rest with a spatula until magma-like consistency. Put batter into piping bag with large piping tip (I used Wilton 1A tip). Lay Silpat or Silicon baking sheet on baking pan. Smack the baking pan against the floor with both hands to force air bubbles to the top. Poke air bubbles with toothpick. Let it rest for 30 minutes (I discovered this varies with humidity, on a really dry day you only need 15 minutes) until skin forms on the macaron surface. Preheat oven to 290F (this temperature depends on the size of your macarons and type of oven, I have a standard NON-convection oven). Place the baking pan into the oven and set a timer for 7 minutes. At 7 minutes, rotate the baking pan (this is to try and get even heating for all the macarons. Some instructions have said you should create a tent above the baking pan to prevent browning but did not seem necessary for my oven. After another 7 minutes, I rotated the pan once more and baked for 1 more minute. Let it cool on the baking sheet before removing from baking sheet. For the buttercream recipe, I used a Swiss Meringue Buttercream recipe. Since the buttercream recipe makes a massive amount, I cut it down to the following amounts using the same technique. 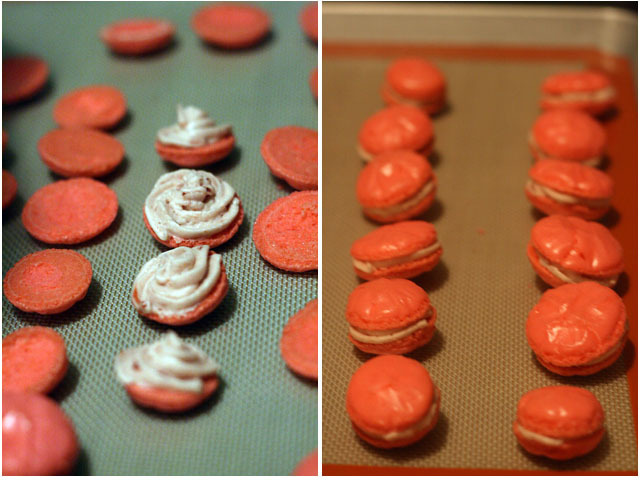 So there you have it, my first successful foray into the world of macarons - Strawberry Jam Pinktober Macarons! What a wonderful filling and such a pretty pink color! I am so proud of you! I am so thrilled that this month's Mactweets challenge was the incentive to take the macaron plunge and look hos perfect! Now you have no excuse not to bake with us every month! Perfect macarons!! @Lora: Thanks! They were inspired by the Mactween Challenge of this month for Breast Cancer Awareness. @Jamie: Thanks for the encouragement! 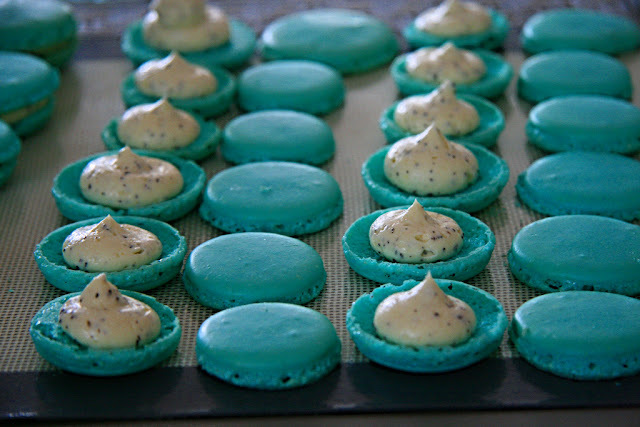 I'm definitely planning on baking with you all in the coming months and challenge my macaron making skills! @LadyMacaron20ten: Yes! Thanks for the encouragement! It's true, once you have the pied you have renewed confidence in your abilities! The lemon curd macarons I did recently were honesty much better! Though, not bad for this attempt! How inspiring to know you took your first mac steps inspired by us at MacTweets! Thank you for joining us, and for bringing these beauties to the pink cause. They are gorgeous! I am one of these lucky people who tried the macarons made by Beyondumani!